This week’s episode almost plays in Pulp Fiction style (or as I am more familiar with, the Simpsons episode titled ’22 Short Films About Springfield’). We see what has happened to everyone other than Rick, Carl, and Michonne (since we found out their fates last week). One group will walk by a spot and notice something, and then we’ll see a different group having gone that way earlier, causing what we’ve already seen. It’s difficult to describe without specific details, so hopefully my review will unmuddy the waters for those who I’ve totally confused above. It starts with Beth and Daryl running through the woods. Beth is narrating the scene with passages from a diary she started at some point. Beth and Daryl are resting, but Beth is intent on doing something. She wants Daryl to track, because he’s a tracker. Daryl is just sitting there saying nothing. Beth goes off on her own, and Daryl begrudgingly follows her. She is convinced everyone is ok, and Daryl is not so bright eyed. Beth finds some footprints, which she takes as a sign that “they” are alive. Daryl only confirms that they were alive four or five hours ago. Daryl sees some trampled grapes, and determines that the people that were there got scared and took off in a hurry. They find an open area with a bunch of dead walkers. Beth takes this as a sign that the people survived, but Daryl points out blood on a bush that is not from a walker. We begin with The Governor doing what The Governor does best, convincing a camp full of people to attack Rick’s group at the prison. 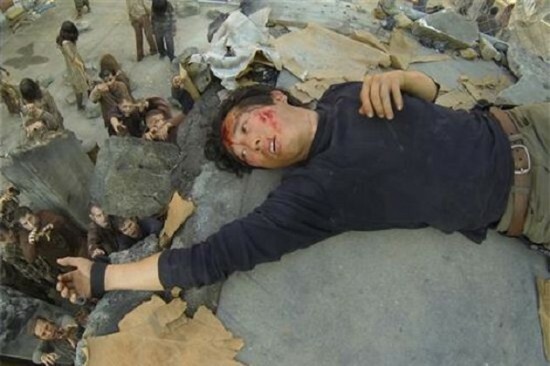 The Governor tells them that they burned down his city and killed his daughter. There a few good people there, but most of them are thieves and murderers. While The Governor is talking to the camp, a flashback is shown of him knocking out Michonne and pulling a gun on Herschel. He tells his group that he has captured two of the prison’s members, and this will ensure a safe, bloodless transfer of property. He has kidnapped Michonne and Herschel so that Rick will give up the prison in return for their safety. Everyone agrees to The Governor’s plan. Well all except for Lilly. She overheard The Governor’s speech, and thinks they are fine right where they are. The Governor tells her he is glad she heard (which I’m sure is a lie) and that the prison is the only safe place for them. Michonne and Herschel are being held captive in a trailer. 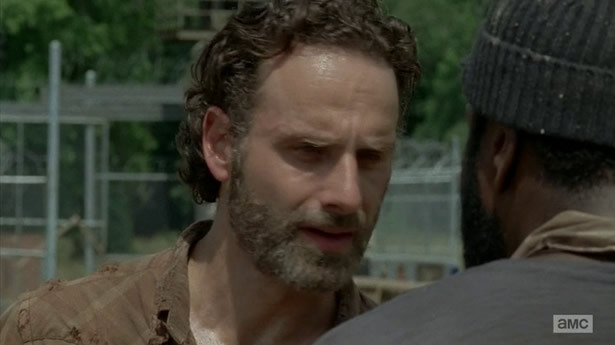 Herschel tries to convince The Governor that the two camps can live together in peace. Herschel realizes that The Governor has changed, and tells him that Rick has changed as well. If he talks to Rick they can work something out. The Governor is not willing to do this. He can’t live together with Rick and Michonne. In this episode of AMC’s The Walking Dead Tyreese demands that Rick find out who killed Karen and David. When Rick is not as gung-ho about finding the killer as he feels he should be, Tyreese punches him twice. Rick snaps and beats the holy hell out of Tyreese. Daryl of all people calms the situation. Everyone that was in the cellblock where the infection first started is now sick, including Dr. S and Sasha. There is no stopping the sickness, but it may be able to be treated with antibiotics. Daryl and Michonne volunteer to go to a vet school about 50 miles away to try and find some medicine. Children and the elderly will be quarantined for their safety. Tyreese seems to be going a bit nuts, and tells Rick if he doesn’t find the killer today, than Tyreese will find them himself. Meanwhile, Glenn is also sick. Herschel leaves quarantine, but Carl insists on going with him. Rick left Carl “in charge” of quarantine, and it seems to be going to Carl’s head. Herschel is collecting some berries as Carl stands guard. They find a couple of walkers, but nothing to worry about. Maggie scolds Herschel for being outside, but Herschel knows he can do something to help the infected. If he is risking his life no matter what he does, he may as well do it helping others. Hey folks, I’m back after a couple of week layoff. I had some family stuff to attend to, and was unable to do any recaps. But I’m back now, and ready to go! 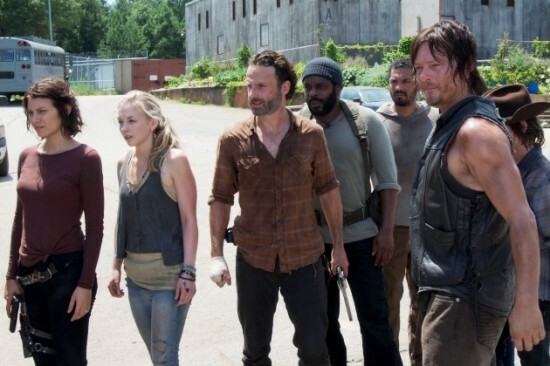 A flashlight is shown shining on the walkers outside of the prison. A rat is fed to them, but the person feeding them is never shown. I immediately thought of The Governor, but perhaps someone on the inside is doing his bidding. Tyrese and Karen part ways for the evening, as they stay in different cellblocks. Karen stops off in the bathroom, and thinks she hears a noise. As we all wait for the zombified Patrick to attack, she sees nothing and leaves. Patrick emerges after she leaves. Patrick enters the cellblock and almost goes into Karen’s cell, but hears another man cough and goes to him. Patrick enters the man’s cell, and kills and eats him. Patrick hears another person coughing, and goes to them. We see the man he just killed wake up, now a zombie. Rick is teaching Carl about the importance of their farming duties, when the alarm sounds. People have found the walkers in the cellblocks. 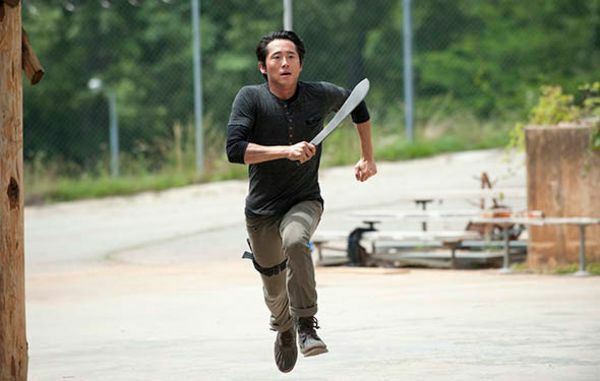 Carl is heading to the watchtower, when he sees Michonne trying to get back into the prison grounds. He lets her in, but several walkers follow her.